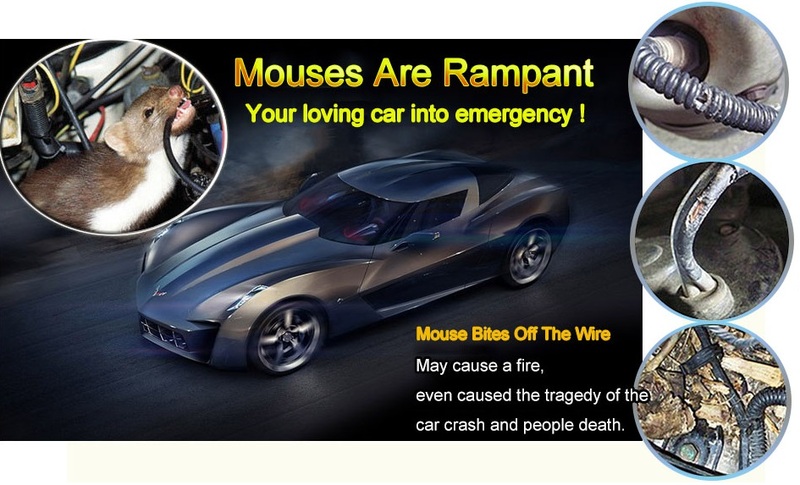 Powerful Mice Control: Three eyes flashing light,visual stimulation,and the destuction of mouse auditory system of mice,the unbearable panic and unrest,unable to reproduce,accelerate the escape from your love car. THE MOST ADVANCED TECHNOLOGY-High-tech methods: SD-048C mouse repeller combines the power of Electromagnetic, give out one kind of peculiar ultrasonic wave which can irritate the nervous and audio system of the mouse Ionic and Ultrasonic waves .It is not just drive mice and other household pests but also to purify the air in your home! POISON FREE TECHNOLOGY: Ultrasonic Mouse Repeller Vehicles Dedicating, Ultrasonic technology Zero chemicals,no toxic residues that will notharm children and your pets. PROVEN AGAINST PETS: Uses both ultra-sonic and electromagnetic two pronged technology wave to drive out mouse from their hiding holes. LED Lamps - By using three strong flash LEDs, the mice's system is disturbed so that it not have any "adaptability" and "immunity." 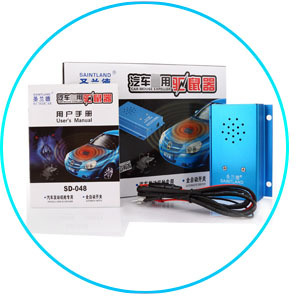 Mainly this device can be used specially in the vehicles cabins for preventing the mice from damaging in the vehicles. Mainly this device can repel the mice,Also it can have some restraints to the following . This product mainly used to get rid of rats, at same time have some inhibitory effect on cockroaches, ants, spiders, crickets, bugs, fleas, silkworm moths; and to human body and pets harmless, no pollution to the environment. The use of modern microelectronic technology means that it can intermittently and intermittently produce extremely low frequency electromagnetic waves and ultrasounds acting on the auditory and nervous systems of pests such as mice. 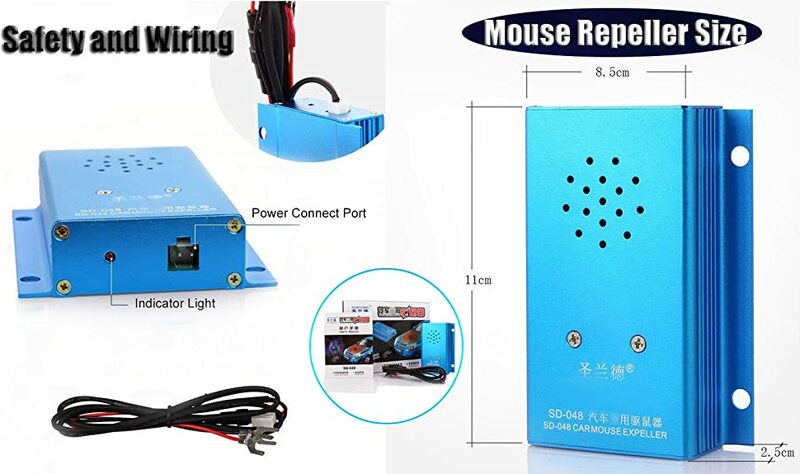 Our mouse repeller is mainly used for the interior of engine room of various automobiles to prevent mouses from entering the engine room to damage the automobile. 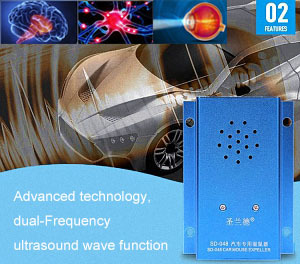 CLEVER BRIGHT Mouse Ultrasound Repeller The effective range is 100 square meters. 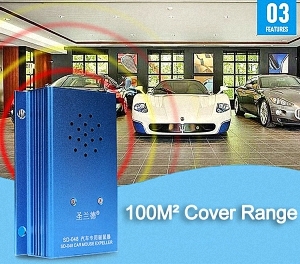 Can be widely used in a variety of garage, parking, private parking spaces and so on. 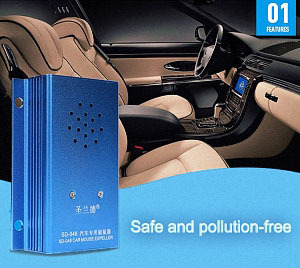 Open the car engine compartment lid and secure the product in a suitable space inside the cabin. Then insert one end of the power cord into the square power port on the top of the product; the other end is connected to the positive and negative electrodes of the car battery according to the polarity.